I drew this yesterday at Liz’s middle school, while waiting for her to get done taking a math test. She’s about three weeks into her school year, and her math class is so easy she actually went to her administrators and asked if she could get placed into a higher class. She was told she’d have to take a test, so yesterday that’s just what she did. We were really impressed that a kid who will only spend a few more months at this school before moving to Eugene, Oregon where she and her brother will get to unschool, is so into math that she’s demanding she get a more challenging environment. I saw a drawing prompt once that was, “Try drawing a bicycle from memory,” with the joke being that it’s a lot harder than it seems. It’s easy to imagine the basic geometry of a bicycle, but if you take a pencil and try to sketch what you see in your head, it’s surprisingly hard to make the bike on the page look correct. I had my little sketchbook with me, so I sat outside the school on a bench, and began sketching this bike, which was locked onto one of the racks (you’ll notice the racks don’t appear – I’m not that good yet, or that fast). While the fibromyalgia doesn’t let me walk far, I used to be able to bike a few miles before the really severe pain kicked in. But that changed a couple years ago, and now I can’t manage to get far at all. But Eugene has bike trails, and the kids and I want to ride bikes around town. What to do? Get a bike with an electric assist! So I did what I never thought I’d do: I sold my Brompton folding bike a couple weeks ago…. …and used the funds from the sale to put in an order for this! Mine will be purple (of course) with green brake lines, and have the e-assist (not shown in this photo). This is a Haul-A-Day, made by Bike Friday in Eugene, Oregon. I’ll go to Eugene in December to pick it up. 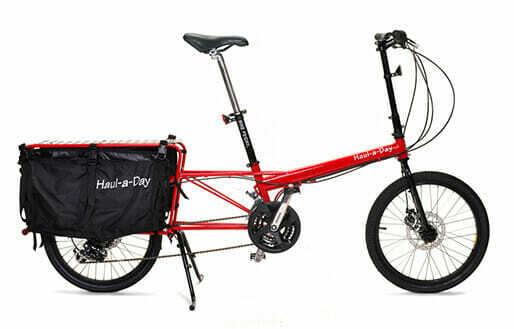 If you’ve seen cargo bikes around Seattle, you’ve probably seen the Xtracycle, it’s a very popular model here. The problem is, they’re very expensive and very heavy. I got to ride an e-assist version of an Xtracycle a couple years ago at the Sustainable Ballard festival, and it was fantastic fun to ride, but it weighed more than I did (and I am not a light person). The whole purpose of an e-assist bike for me is to give me a boost so that I don’t end up getting overwhelmed with fatigue and pain, and unable to get myself home. However, in the event I do end up unable to get myself home, someone has to come pick me up, or I have to find a bus I can get home on, and an Xtracycle is too long for a bus rack (not that I could lift it anyway) and would be impossible for us to stuff into the back of our wagon. A bike that can carry both a few bags of groceries and some odd-shaped things (like mine and my daughter’s ukuleles). A bike that can fit into a bus rack. A bike that can fit onto a standard car rack. A bike that can even fit into an Amtrak rack (for visiting Portland and Seattle from Eugene). A BIKE THAT CAN BE PURPLE. A bike that can have e-assist to help me ride. All that for less than a third the cost of an Xtracycle. But what really convinced me was the community of Bike Friday owners I found on Facebook (and in real life – I have friends who love their Bike Friday tandem!). What kind and friendly people! I’ve been having so much fun in this group. And wow do they travel. Bike Friday is originally known for their folding bikes (my model doesn’t fold) that work great for taking on planes, and people are toting these things all over the world for bike tours. I don’t know if my health would ever allow me to do that, but it’s fun to dream. A lot of people went on group bike tours of Japan this past year, and their photos are just beautiful. I didn’t realize how much of the world is accessible through bike tours until I joined this group. Employees from Bike Friday are in the group too, and it’s clear they love their job and really want to help their customers (thanks, Jarl and Walter!). After seeing how satisfied BF owners are, I was ready to take the plunge and get one myself. September 26, 2018 by Hollie6 Comments on Where did everything go? If you come here often (you’re in a small, illustrious group), you’ll notice some posts missing. This site doesn’t get a lot of traffic, but I’ve had a few posts that were busier than others, and you might notice their absence. I love photos. I didn’t realize how important they felt to my posts until I discovered most of them broken (not showing up correctly) a few days ago. Especially all those posts about sewing….with no photos they just didn’t work. I contacted WordPress customer support and was told that this was due to some broken link issue that they couldn’t fully solve. I was pretty upset about that. They could fix a few posts, but I’d have to go through the rest of the (many) posts and re-do all those photo links myself. As you know, I have fibromyalgia, and spending what little energy I do have in a day trying to fix something that should never have broken (beware the “export” feature on WordPress, it lies), just isn’t my idea of a good time. Had I known this was going to happen, I never would have moved my blog. C’est la vie. Instead of fixing years of posts, I downloaded them for my own archive, and then just let them go online. A fresh start sounded nice, anyway. We are in Seattle until the spring, when we’ll be moving to Eugene, Oregon. For my sewing friends, I want to let you know I probably won’t be making any sewing posts until after we move. In the interests of energy conservation, I’m packing up everything that I can, as early as I can, and this includes my sewing room. Because I need something to do that relates to art or color (how else does one survive? ), I left out what was easy to carry around: my art stuff. I’ve been doodling again, seeing how possible it is to learn to draw in my middle years. These are interesting years. Sometimes I’ll feel wrecked with the awareness of how much practice time has already been lost (for art, and other things). And then sometimes, I’ll feel such a delicious freedom in knowing that I can learn without pressure, practice for the joy of it. The trick is remembering, when negativity hits, that ruminating on what time I “wasted” (one could argue I was plenty busy) is, in itself, a waste of time. When that happens, I reach for my pen, and just doodle something.